YES! Time for new toys! Anyway, The Con was AMAZING! 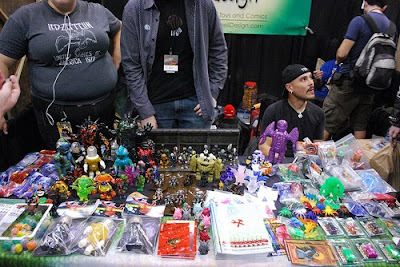 There were A LOT of big name toy artists to schmooze with and plenty of toy fans to hang out with as well. I carted around a blank Kapukeeki to show to artists and gauge interest in getting some pro-customs done. Feedback was general super-positive and I'm looking forwar to pursuing these interests in the very near future! The RAMPAGE TOYS Shelf at the TENACIOUS TOYS booth!!! Thanks to Benny (purveyor of AWESOME via the Tenacious Toys website) for hosting my first 'big' release fig, and for being just all around AWESOME! My Favorite place to hang (besides the Tenacious Toys booth!) at the Con! 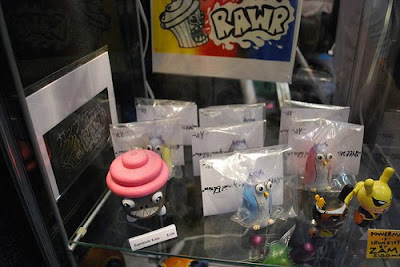 The O'Nell Designs booth had THE BEST toys at the Con! These resin masters were not only fully stockes with amazing toys, but also happened to be the coolest, most friendly artists anywhere! Shout out to Marty (TGB), Paul (Kaiju), Jesse Destasio and Matt - AWESOME!!! Blank Kapukeeki Kaiju resin figs! Any artists want one? Halloween edition of the Kapukeeki Kaiju Resin Toy! Only 5 will be made - maybe less! They will be made to order. Available here. Remember these toys from the 80's???? 'Muscle Men' - I think they were called. Well, here's one converted into a Kapukeeki-Lucha toy! All 1.5 inches of AWESOME! Not sure when I'll mold/cast these, but it will happen! Thanks for checking in! If you want any toys or paintings or anything like that, just e-mail me! I'm psyched on comissions right now, so ask away!